Charleston’s rise as a top destination has been fueled by more than its charming historic district and warm weather: It’s also a food lover’s paradise. 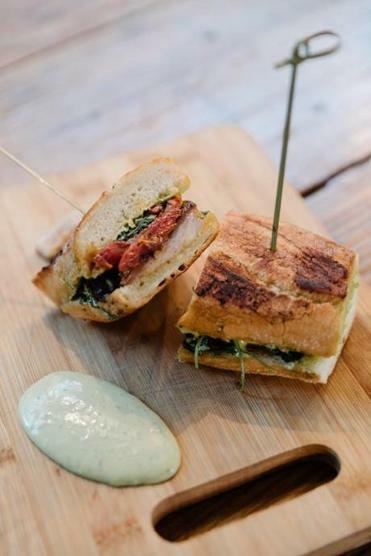 The Cuban sandwich with pork belly from R Kitchen. Editor’s note: We’ll have a brief update next week from Daniel McGinn on Charleston, South Carolina, after Hurricane Florence. Most of the time, I’m immune to FOMO, or fear of missing out. I don’t begrudge others’ fun experiences or obsess over missed opportunities. There’s one exception: When eating at a new restaurant, I agonize over what to order. I ignore tablemates while scanning the menu, worrying that I’ll make a suboptimal choice. And when the food comes? I look longingly at other’s dishes, comparing and second-guessing. 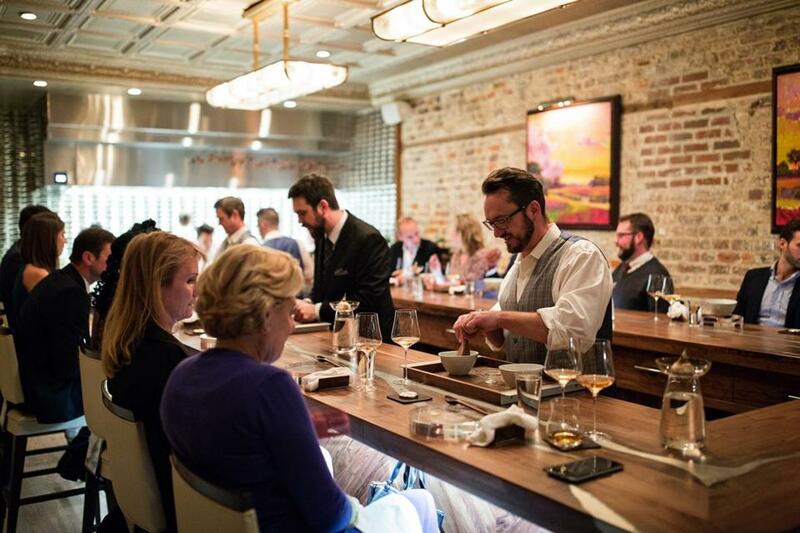 McCrady’s is a 22-seat, tasting-menu-only restaurant that, barring allergies, serves every guest the same 13 to 17 courses each evening. In the open, brightly lit kitchen, staff members use tweezers to plate locally grown morsels. The attention to detail goes beyond the food. After placing a dish in front of me, one server quietly intones “War eagle” — a greeting used among alumni of Auburn University. That’s odd: I’m not sporting any school logos, and the only place my Auburn degree is listed is on LinkedIn. “Did you Google my name from the reservation book?” He smiles, introducing himself as a fellow alum. “We like to know as much as we can about our guests,” he confesses. 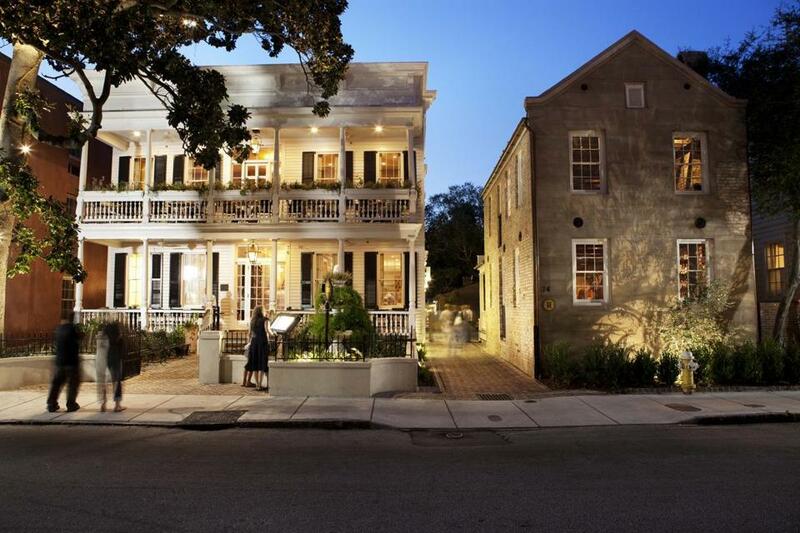 This brand of hospitality has turned Charleston into an idyllic weekend getaway — particularly from Boston, where direct flights take about 2½ hours and roundtrip fares are often in the $250 range (though the lowest fares aren’t necessarily direct). Travel & Leisure and Conde Nast Traveler have named Charleston the top US destination for six and seven consecutive years, respectively. Locals say there is no better time than the fall, when daytime temperatures are bearable, nights are cool, and ocean beaches remain warm enough for swimming. Charleston has been a tourist hub for more than a century, but three factors have driven its recent surge. The first was Mayor Joseph Riley, who served more than 10 terms from 1975 to 2016 and used that extraordinary tenure to redevelop broad swaths of the downtown. “You see all these storefronts?” asks an Uber driver zipping through the high-end retail district on King Street, south of Calhoun Street. “Twenty years ago, they were all empty.” (Indeed, the neighborhood near our hotel, the DoubleTree by Hilton just north of the City Market, was once too sketchy for tourists to walk at night.) The second factor: About a decade ago, Charleston began upgrading its airport and lobbying airlines to add flights. Southwest Airlines opened routes in 2011, JetBlue followed in 2013, and the competition drove down fares. The third spark: A generation of innovative Southern chefs began opening restaurants in the city. The most noteworthy is Sean Brock, who was raised in rural Virginia, attended culinary school in Charleston, and cooked in Richmond and Nashville before becoming chef at McCrady’s in 2006. By the end of 2010, he’d won a James Beard award, appeared on Iron Chef, and opened Husk (843-577-2500, huskrestaurant.com) in downtown Charleston. A lengthy New Yorker profile from 2011 describes how Brock’s obsession with long-forgotten local foods leads him to plant his own acreage with experimental vegetables. Visitors take in the surf at Folly Beach. There are plenty of between-meal activities in Charleston, too. 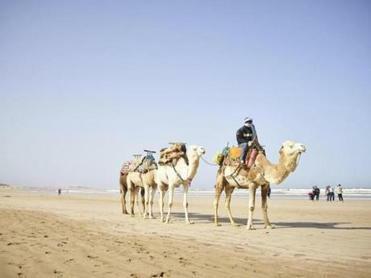 Nearby are sparkling wide beaches. 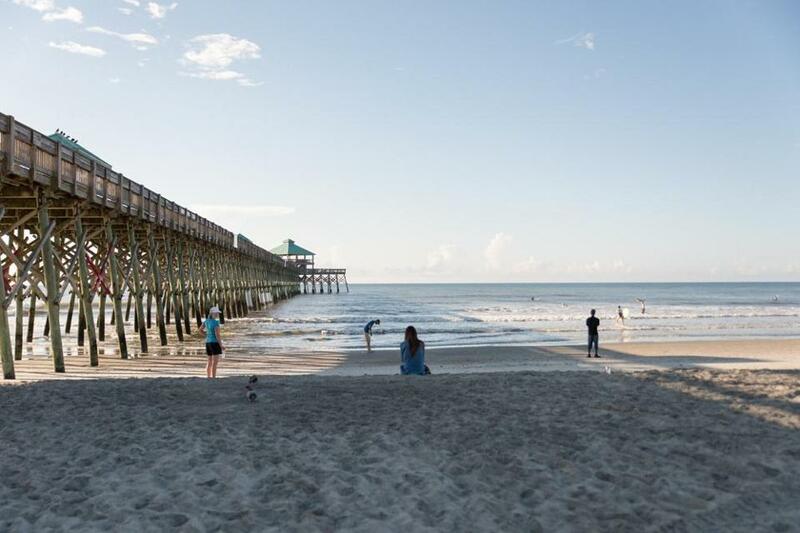 (I spend one pleasant morning in the warm surf at Folly Beach, a half-hour south of downtown.) The shopping district, centered on the main thoroughfare of King Street, includes global luxury brands and local boutiques. 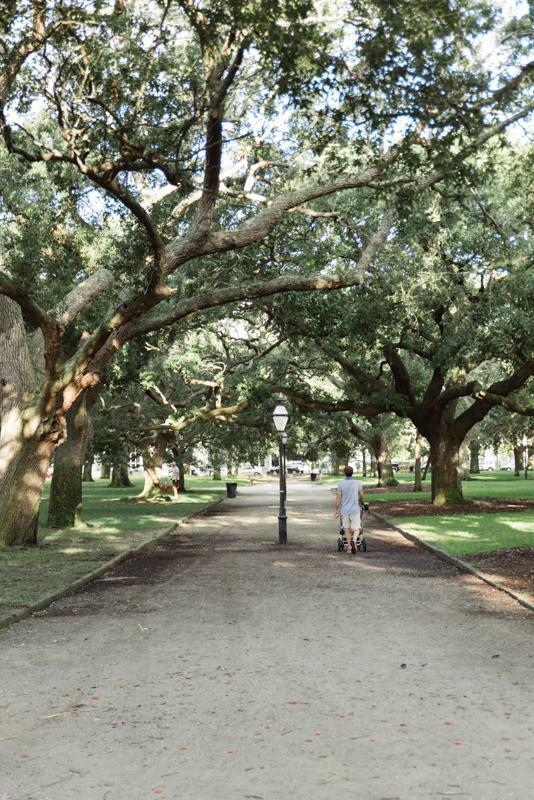 Tours of all sorts — house, bike, horse-drawn-carriage, and kayak — abound, most meandering through the downtown historic district, where the north-south grid gives way to winding streets (a sign of the city’s colonial roots). Some dead-end on the harbor, with Fort Sumter (of Civil War fame) visible in the distance. Twenty minutes outside the city are plantations open to tourists. All around the city, there are ways to celebrate the rich local history. One morning I join a group of 20 for a walking tour (843-580-4019; freetoursbyfoot.com), led by Scott Nelson, a former curator at Mount Vernon in Virginia. During two hours we pass churches and graveyards, historic government buildings, and lavish old residences as Nelson explains how the city evolved from a walled Colonial outpost to an agriculture and trading hub to a diversified modern city. The most surprising aspect of Charleston’s history is its openness about its role in the slave trade and the continuing challenge of race. On tours, guides explain that approximately 40 percent of all enslaved Africans bound for the United States arrived through Charleston’s port, with the city also serving as a hub for the “domestic slave trade” in which their descendants were sold and resold among plantations. Near a downtown parking lot, a sign marks the plaza where slaves were once auctioned. In 1856, as abolitionists gained power, the city outlawed outdoor slave sales, so traders moved indoors. Today the largest such auction house is preserved as the Old Slave Mart Museum (843-958-6467, oldslavemartmuseum.com). Inside, informational exhibits are paired with some artifacts to explain the cruel economics of the practice. That history lesson continues at Boone Hall Plantation (843-884-4371, boonehallplantation.com). Among the handful of preserved plantations open to tourists near Charleston, it’s also known for offering the most candid look at slave culture. This story is told to the left of the main house, where nine original brick slave cabins are preserved. A docent describes the “short, brutal lives” of the malnourished, overworked people who once lived here. In one cabin, a woman weaves sweetgrass baskets; in another, displays show inventories of the plantation’s slaves, such as the 252 who lived there in 1854. Outside the ninth cabin, an African-American woman in a bandanna offers a song-laden presentation on Gullah culture. She explains how practices that originated in West Africa continue to influence the language, cuisine, religion, and music embraced by descendants of slaves who live in this region. Diners wait for one of two nightly seatings at R Kitchen. Soon the history lessons end, and it’s time to eat. Our first night in the city, we head to R Kitchen, (843-789-4342, rutledgekitchen.com), a tasting-menu-only restaurant in a residential neighborhood a few blocks west of Upper King Street. (There is a second location in a suburb west of the city.) The place resembles a modest house into which an open-style professional kitchen has been built along one wall of the living room, with just 16 seats in the kitchen and another 20 on a back patio. Diners find the night’s five-course menu scrawled on a chalkboard. Part of R Kitchen’s popularity stems from the cost: $35 for the entire meal. At the 8 p.m. seating, the vibe is casual and unhurried. The chefs, Chris and Tim, banter with diners. “We call these ‘sea marshmallows,’” Chris says as he plates seared scallops nearly the diameter of racquetballs, topped with a corn salsa. (This second course is preceded by a duck salad, and followed by thick slices of seared tenderloin under Vidalia onions in a Madeira sauce.) Next comes roasted pork shoulder with a delicate white gravy over locally grown rice, then a peach-topped shortbread. If this dinner were served in a typical restaurant, it would rate as solid and tasty. But in such an intimate space, where you can talk with and closely observe the chefs, and with an astonishingly affordable bill, it’s extraordinary. A chef prepares a dish at McCrady’s. On Friday evening, the tasting menu at McCrady’s takes things to a different level. Set in an old brick tavern where George Washington once dined, the restaurant features a U-shaped raised counter, with the open end facing the kitchen. The glassware is so light it seems to float; the steak knives are handcrafted by a local artisan. 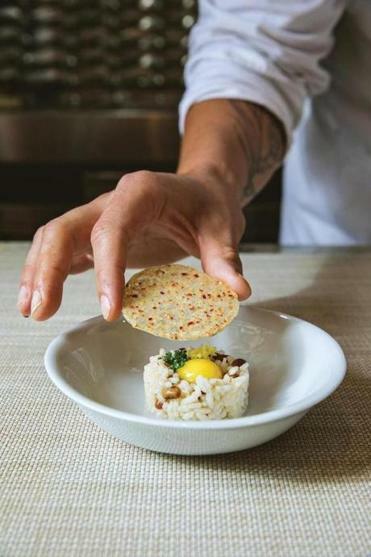 The bite-sized courses include oysters, crab, mahi, clam, rice, and a “foichamacallit” — a miniature riff on a Whatchamacallit candy bar, but with foie gras inside. The reserve-level wine pairings include a 1929 dessert wine and a Japanese sake whose ridiculously complicated distilling process is performed partly in an igloo. By the third course, my traveling companion — a childhood friend named Dean — looks over, slightly dazed. “I feel like my mouth is dreaming,” he says. Downtown, where the city’s best restaurants are located, the night life skews early, with people enjoying pre-dinner oysters and cocktails. Try The Rooftop, a bar with views of Charleston Harbor that sits atop The Vendue hotel (843-577-7970, thevendue.com) or Pearlz Oyster Bar (843-577-5755, pearlzoysterbar.com). For diners with stamina and a youthful spirit, the after-dinner destination is Upper King Street, north of Calhoun, which contains blocks of bars and restaurants. (A food truck sells liquor-laced ice pops.) “You can’t even drive down this street on weekend nights,” one Uber driver complains. One evening, we wander in and out of a half-dozen bars, listening to bands, eventually securing a spot on the rooftop bar at Stars (843-577-0100, starsrestaurant.com) to people watch and catch up. Another evening, we grab after-dinner drinks at The Belmont (thebelmontcharleston.com), where a diligent doorman limits the head count, creating an uncrowded and comfortable atmosphere. Diners seated at McCrady’s U-shaped counter. On our final night in Charleston, we forgo the suggestion to eat dinner twice, and show up for our 10 p.m. reservation at Husk. The restaurant has tables on two floors in what was once a gracious Southern home, but the most impressive element is a gigantic chalkboard beside the hostess stand, listing the local purveyors who’ve stocked the kitchen on this day. Sipping cocktails at our upstairs table, we scan the menu. This exercise is artifice, really: I’ve been looking at the menu online for days. Eyeing the six entrees, my traveling companion chooses the confit duck leg, and I’m locked on the wreckfish. But when the waiter appears, the familiar panic reemerges. Am I making the best choice? I tell him I’m thinking of the fish, but then ask which entrees are most popular. “The duck and the pork, by far,” he says, describing each in some detail. I hesitate, and then impulsively shift to his suggestion: the Carolina Heritage pork with sweet corn, charred shishitos, and peaches. No surprise: It’s a fine, flavorful dish. But midway through, I realize it’s the fifth piece of pork I’ve had in three days, and after enjoying bite-sized tasting menu portions the last two nights, the size of the rich entree feels overwhelming. As I eat, I wonder if the fish would have been better — or if the bar at Fig might have been the smarter play. Then I take a sip of wine and relax. 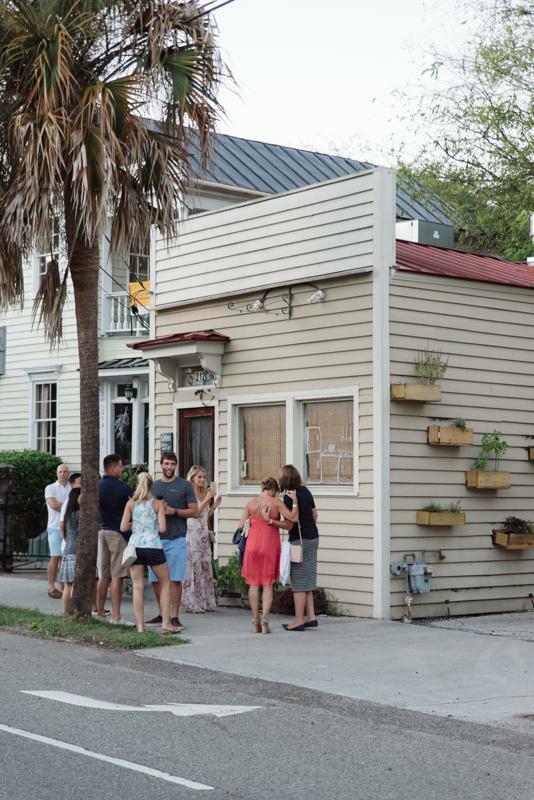 In a city with as many options as Charleston, FOMO seems inevitable. Instead of stressing out or eating dinner twice, we make a more sensible choice: resolving to visit again. White Point Garden in Charleston’s historic district. Daniel McGinn is a senior editor at Harvard Business Review. Send comments to magazine@globe.com. Get the best of the magazine’s award-winning stories and features right in your e-mail inbox every Sunday.Sign up here. This story has been updated to clarify pricing for airfare to Charleston, South Carolina.